Welcome to Madrid– get ready to eat! Wondering where to eat in Madrid? Not only will I share my favorite local spots below, I’ll also tell you the 18 must try foods in Madrid so you can be sure to order well in this foodie city! It seems like only yesterday Alejandro and I moved from Cadiz to Madrid and started our lives in Spain’s capital. How things have changed since then! Six years later, I feel like I’m only just discovering the layers of this incredible city. Madrid is a funny place– there’s no Eiffel Tower or Colosseum. At first, it might seem like there’s not much to do… but don’t be deceived, this is a city that never sleeps. 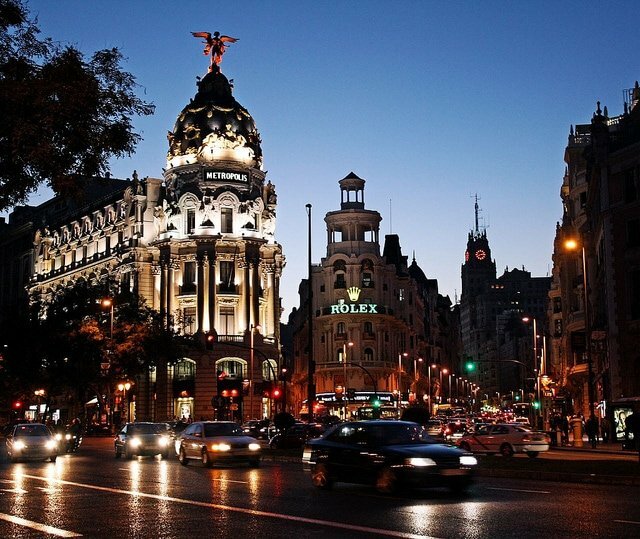 Shops, markets, museums, parks, expositions, concerts, theaters, restaurants, bars… Madrid has it all… and then some! I’ve written dining guides for Barcelona, Seville, Cadiz, El Puerto de Santa Maria and Malaga— but never for my own home city, Madrid. Why? 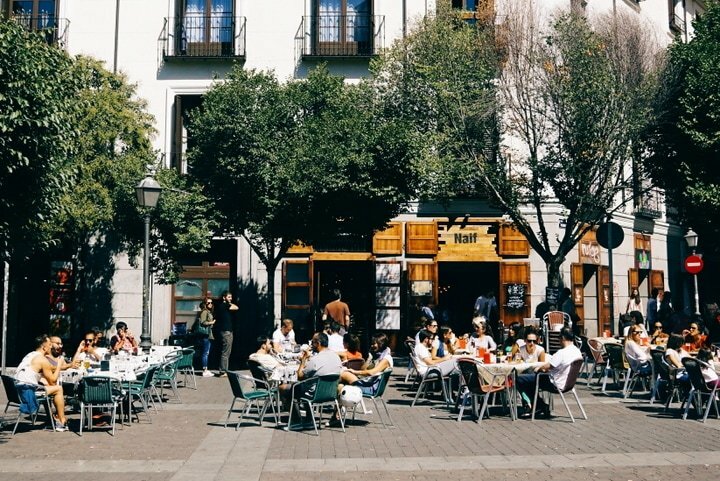 For starters, Madrid has over 8,000 restaurants listed on Tripadvisor and only 702 things to do– it’s pretty clear how we locals prioritize our free time! For reference, New York City has about 10,000 restaurants– Madrid is quickly catching up! Tapas bars, cafés and restaurants are a way of life in Madrid. Locals live by the combination of walk/stop/eat/repeat, and food and drink always go together (in Madrid tapas come free with drinks– at the traditional places). Madrid is a city where weekends are about leisurely lunches and drinks on a terrace and where everyone has a (strong) opinion on their favorite places. Lunch on a Madrid terrace. Of Madrid’s 8,000+ restaurants I’ve only tried a small percentage, and mainly places in the city center (I am constantly exploring new places for my job planning Madrid tapas tours with Devour Tours). Therefore, I’ll definitely be revisiting this guide over the years, adding in new discoveries and taking out the ones who didn’t quite make it. Sadly, we’re witnessing a time when chain restaurants are moving into Madrid by the dozen, buying out the small guys on a constant basis. So this guide will avoid those places, and instead highlight the unique places that manage to hold on, and put their passion into what they do. I hope that this Madrid food guide will encourage you to support these small businesses too (and please skip the chains! ), allowing this city to stay unique. What I love most about Madrid is that it’s a total cross-section of Spanish cuisine. Almost any other Spanish city sticks to what it knows best– local produce and a very regional style of cooking. But not here in Madrid. Madrid is a planned capital (moved in 1561 by King Philip II) and, therefore, became a city of immigrants that came from the rest of this diverse country. 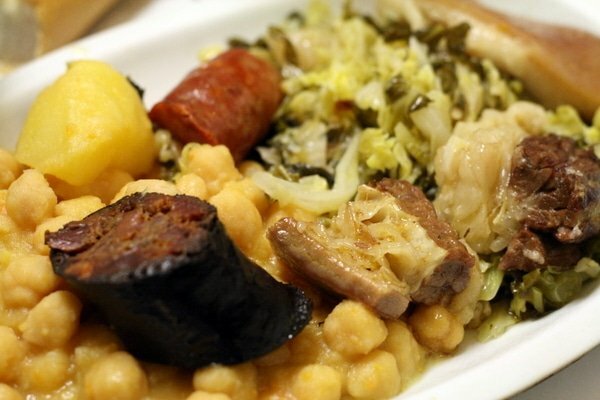 Today Madrid is home to the best Galician food outside of Galicia, the best Andalusian food outside of Andalusia… etc. 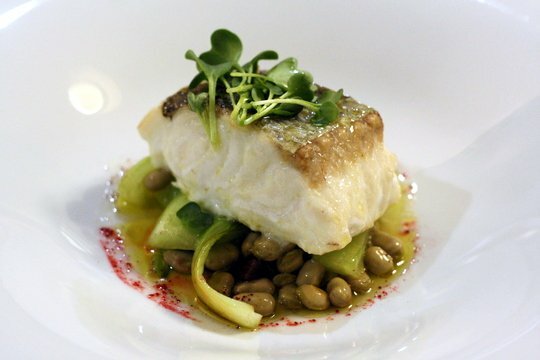 People even claim that Madrid is home to the best fish in Spain– though I’d take that with a grain of salt. While it is indeed home to the world’s 2nd largest fish market, filled with the freshest catch from across the country, there’s something incomparable to eating seafood with a view of the sea itself (which, unfortunately, Madrid can’t offer)! My visit to MercaMadrid, the world’s second largest fish market. Dining out in Madrid is a true adventure, the city is studded with “old man bars” and ritzy restaurants alike. It’s even home to the oldest restaurant in the world (according to the Guinness Book of World Records! ), Botin. 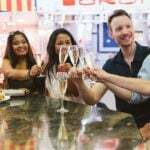 Unlike other Spanish cities where you can rest assured that no matter where you dine, your wallet will suffer minimal damage, Madrid offers everything from budget to luxury when it comes to dining out. And apart from Spanish cuisine, Madrid is a hotbed of international and fusion food. 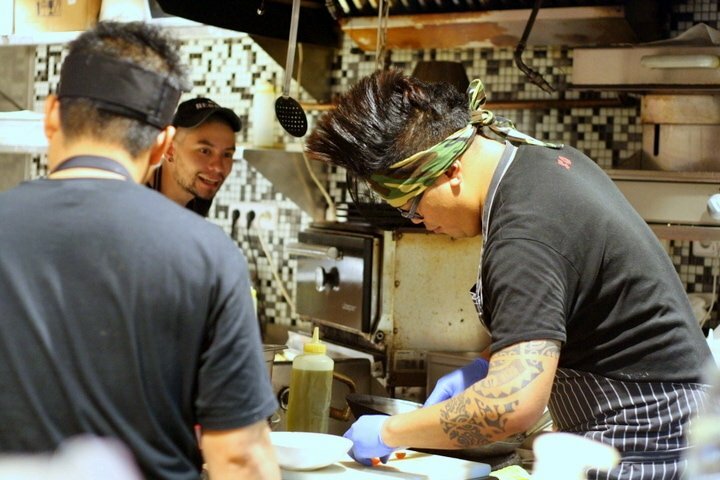 We’re even home to one of the world’s edgiest Michelin star restaurants– the chef rocks a mohawk! To truly scrape the surface of Madrid, you need time. I always recommend booking a rental apartment and living like a local for a week or so (longer if you can!). Resist the pressure to hop on the AVE train to other towns and cities and just stay put. You might be anxious without your checklist of sights to see at first, but after a few days of strolling, sipping and living in Madrid– you’ll be hooked! As I mentioned, the possibilities are endless for dining out in Madrid. You can spend 2€ or 200€ to fill your belly here– even more if you want! Here’s where I’m going to help– this guide will tell you what to eat in Madrid, and later where to eat in Madrid. I’m going to stick mostly to Madrid’s central neighborhoods, places that fall within the M-30 highway that surround the city center. Hope you enjoy! The definition of tapas varies depending on who you ask. Someone from Seville will claim small portion sizes, while in Madrid and Granada they’re free bites that come with a drink. In the end, tapas is the Spanish art of eating together and sharing food. In Madrid tapas come with your drink (though this is less and less common at the modern places). They might be simple olives or potato chips, or something more elaborate. Some restaurants have started including a few “tapas” on their menus. These are usually smaller portions, similar to an appetizer serving. Other restaurants (unfortunately) use the word tapas interchangeably with raciones (large sharing portions). This is misleading, as raciones are large plates meant to be shared among many people. Many tourists order a bunch of raciones (thinking they are small plates) and can’t finish their food. The price of tapas varies greatly in Madrid. They might be free, or you might pay anywhere from 2€ to 10€ for a “tapa” to share. Don’t assume one definition of tapas– ask for help. No one understands tapas here in Madrid. Locals ask questions all the time. How big is this dish? Is this enough food for the two of us? And when in doubt, order slowly. Unless you’re in a more formal restaurant, order drinks first (see if a free tapa appears), then order one or two things, eat and evaluate (if it’s unimpressive change places!) and repeat. That’s Madrid style! 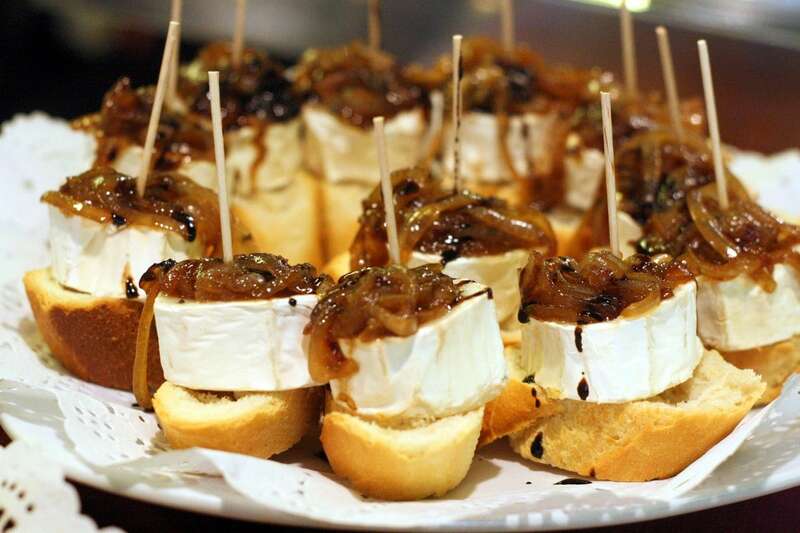 My company, Devour Madrid Food Tours, offers a variety of excellent tapas tours in Madrid. 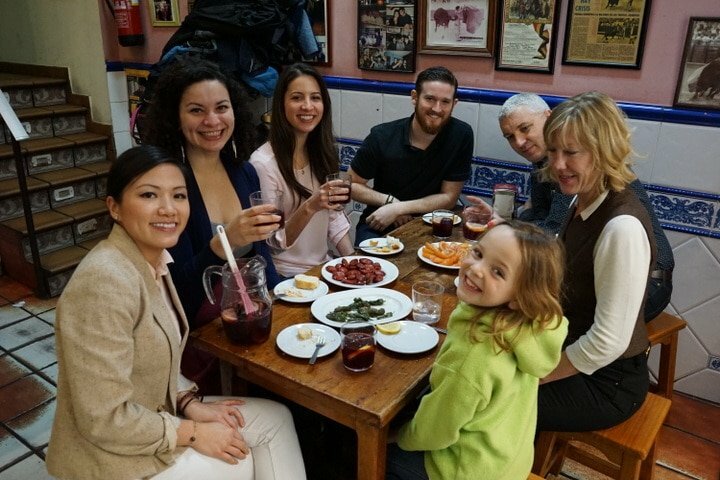 Our mission is to bring people off the tourist track and into authentic Madrid eateries that are family run and serve real, delicious and not “made for tourists” food. 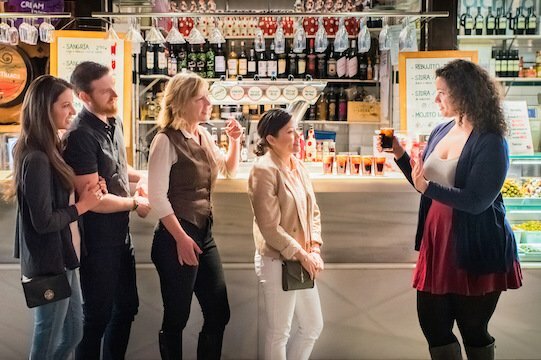 For our evening tours we always like to mix the authentic Madrid tapas experience with another theme, and we offer a 2-in-1 Tapas, Taverns and History Tour (where in-between hundred-year-old tapas taverns you get a historic walking tour of the old town), a riveting Tapas and Flamenco Tour (where you learn the history of flamenco over delicious tapas before going to see a top-rated show), and a Tapas and Wine Tasting Tour (which is led by a local wine expert, and you’ll visit some of the city’s best wine bars for tapas paired with 8 different Spanish wines)! Not a night owl? 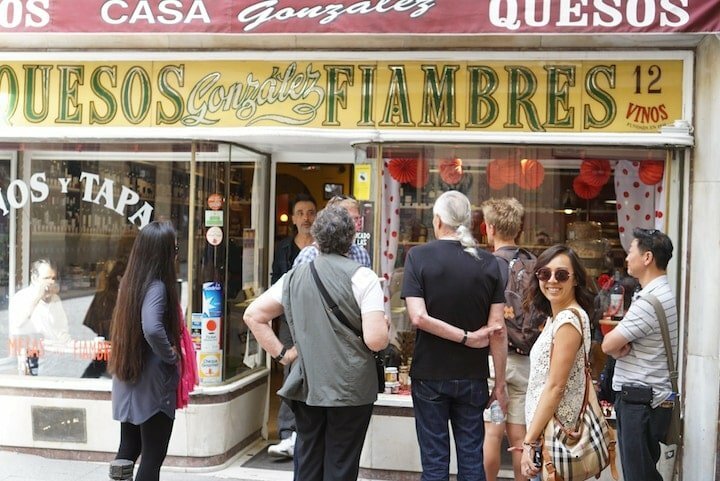 Our daytime food tours give you a unique look at the local food culture by bringing you to the best food shops, delis, markets, tapas bars, pastry shops and more. 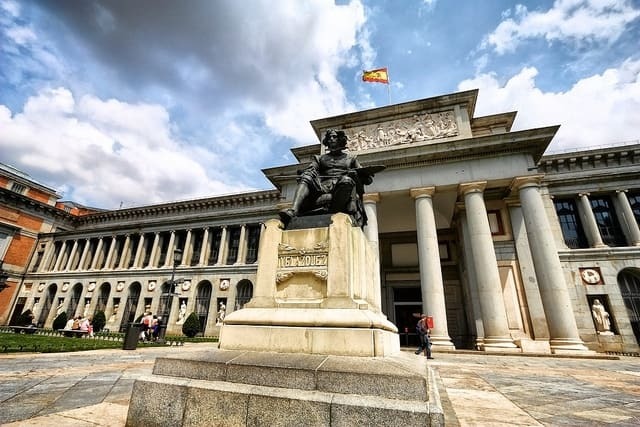 And we even have a tour that combines Madrid’s two most iconic places– the Prado Museum and Botin Restaurant (the oldest in the world! )– the Behind-the-Scenes Botin Lunch and Prado Museum Tour. 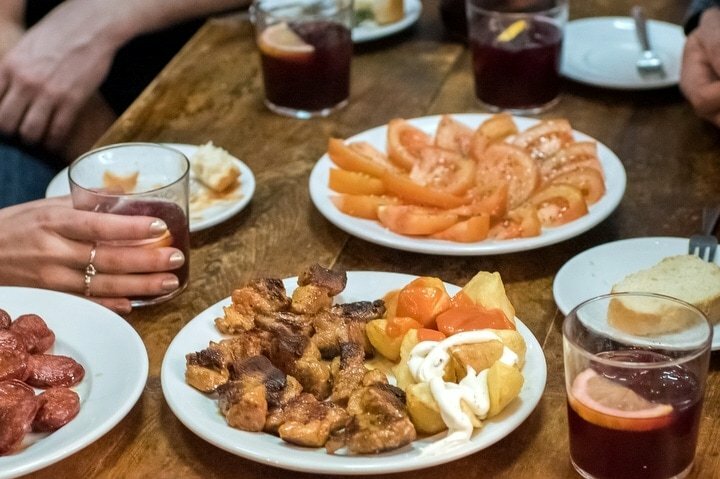 Sure– you can have great tapas on your own by using this guide– but our tours are in-depth, and teach you about the local culture and history, while providing the best quality food and drink (full meals). We’d love to have you along! 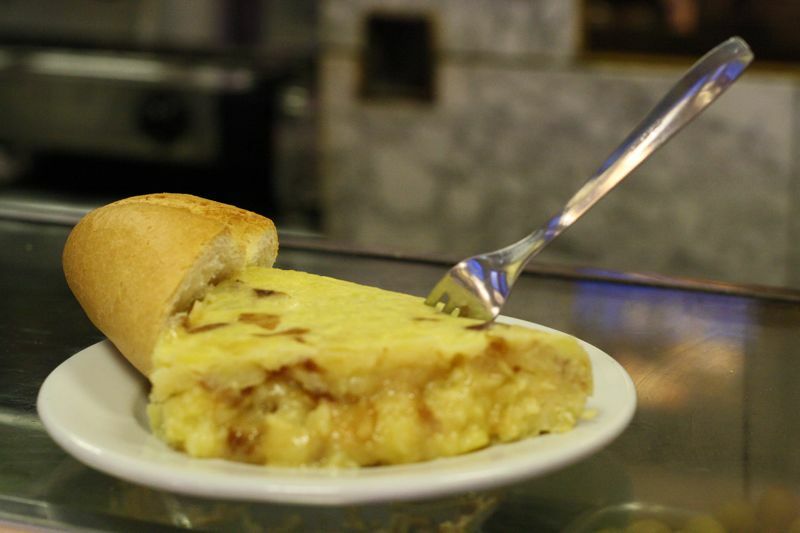 Join us on a food tour to learn all about Madrid’s cuisine! I almost skipped this section, as you could just say “everything!” — but, Madrid certainly does have its specialties. Here are some of the most traditional foods from Madrid that you should definitely try while here. Delicious wine and Iberian ham. 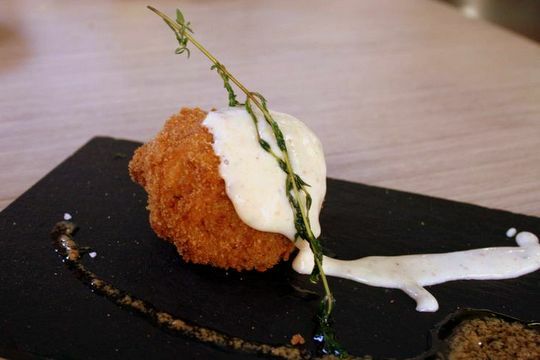 This is something you must try no matter where you are in Spain, and Madrid is no exception! The city is filled with ham delis, offering all sorts of Spanish jamónes. But don’t order anything less than the best for a true gourmet experience– you must try the Iberian acorn-fed ham that’s been cured for 3+ years. It’s an incredible, melt-in-your-mouth experience! 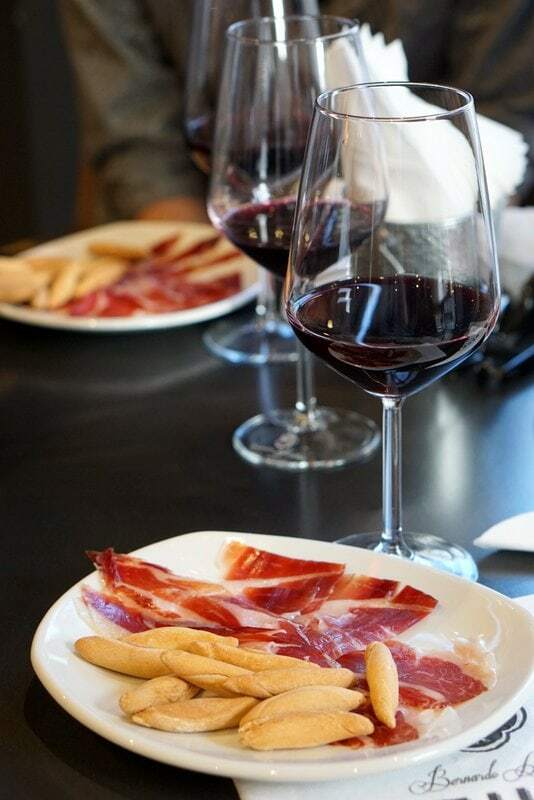 Try it: Experience the “ham challenge” as you taste three different grades of Iberian ham and learn about the differences, on our daytime Ultimate Spanish Cuisine Tour. While I’m admittedly not the biggest fan of tripe, Madrid locals go crazy for this dish. Slowly stewed beef tripe, snout, and pork meat (such as chorizo, blood sausage, and pancetta) combine for a hearty stew that’s not for the faint of heart. 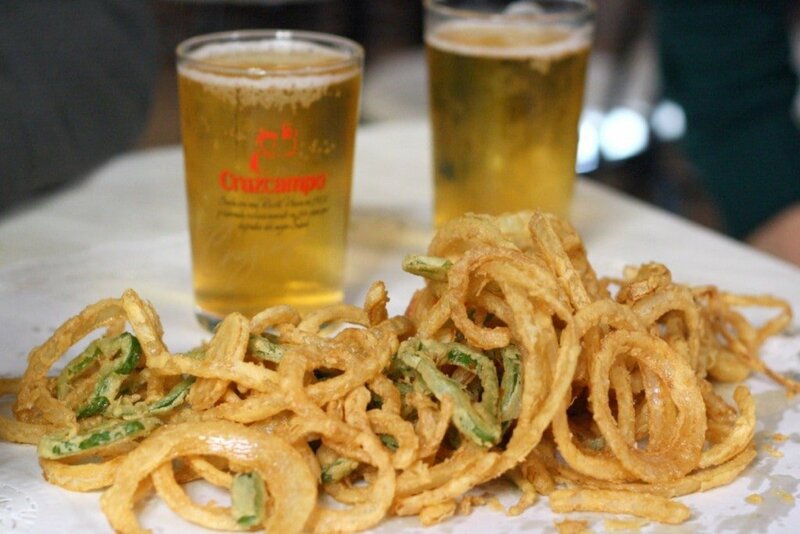 Madrileños love their casquería (organ meats) and fried pig ear is perhaps the most famous of all. Again– not my favorite– but when done well can have all the flavor of crispy bacon. Just try it! Madrid may be famous for fish dishes, but you’ll notice that most are pickled or fried– clear proof of the fact that the city is hours away from the sea. While fresh fish would have been impossible for most of Madrid’s history, today you can enjoy it anywhere. Nonetheless, locals still love their traditional dishes, like these pickled anchovies which are filleted and then soaked in vinegar and garlic until pickled, then served with extra virgin olive oil and fresh parsley. 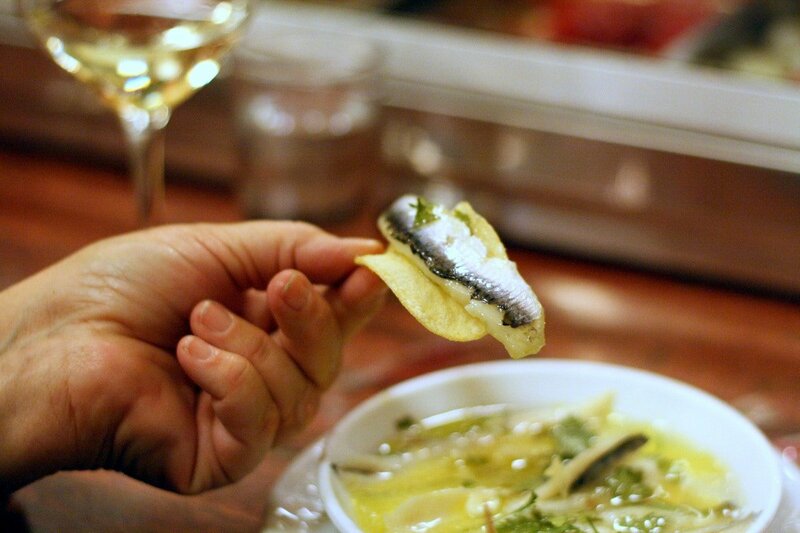 Try it: You’ll taste homemade pickled anchovies on our Tapas and Wine Tasting Tour! 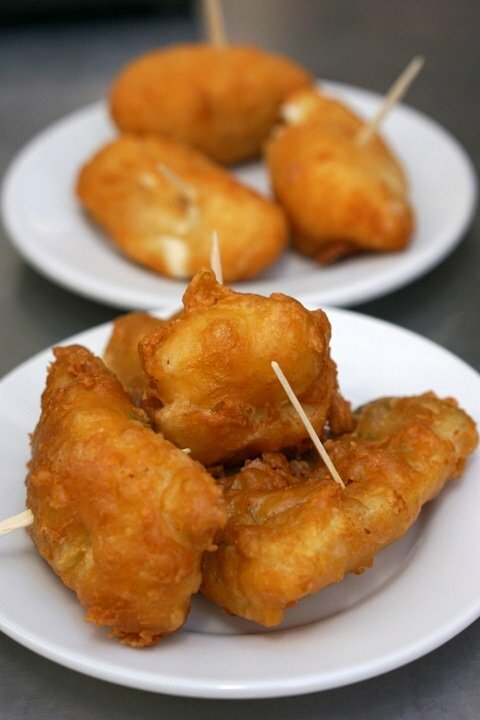 Another famous Madrid fish dish, these fried salt cod fritters are debatably the best snack in town. See my recommendations below for the best places to try them! 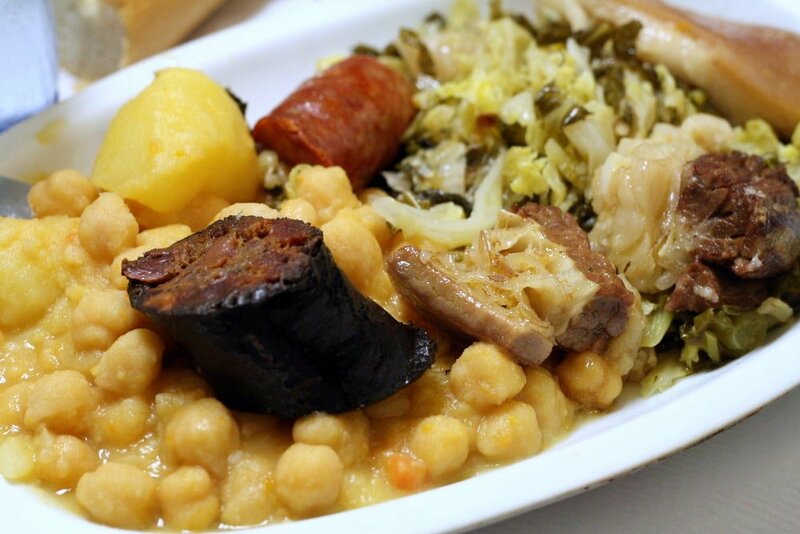 Madrid style cocido, all in one plate! 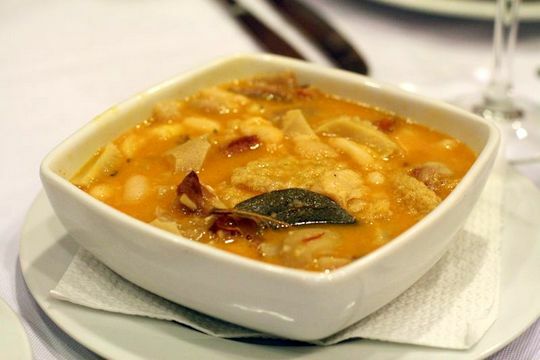 Winter time in Madrid means cocido Madrileño, a hearty stew that everyone loves. Many restaurants offer it as a part of their menú del día (weekday fixed price lunch menu) on either Tuesdays or Wednesdays. Other restaurants specialize specifically in this dish! The stew is served in either two or three courses, starting with the rich broth (made from chicken, beef, pork, chorizo, blood sausage, potatoes, chickpeas and more!) with little noodles. Next, you’ll have the meats and vegetables (sometimes in two separate courses). On the side you can expect sauteed cabbage, pickled peppers, and sometimes homemade tomate frito (fried tomato sauce). You must enjoy your cocido (a two hour plus ordeal) with a hearty bottle of Spanish wine. 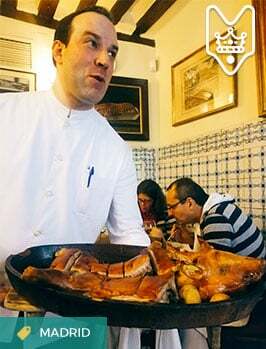 Experience it: Get a tour of the kitchen at Madrid’s most famous cocido restaurant on our Ultimate Spanish Cuisine Tour! Suckling pig and fried potatoes. Slowly roasted baby pig. That’s what cochinillo asado is, making it an ultimate luxury. The suckling pigs are only about two weeks old when sacrificed, and are roasted only with water and salt. 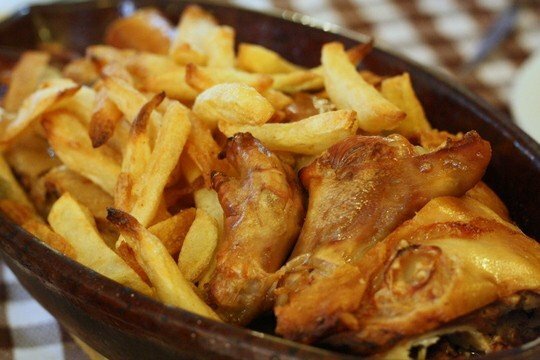 There are some great restaurants in Madrid to try this delicacy (Botín, the world’s oldest restaurant, being THE PLACE) but if you get the chance to try it in Segovia, that’s where this delicacy originates! 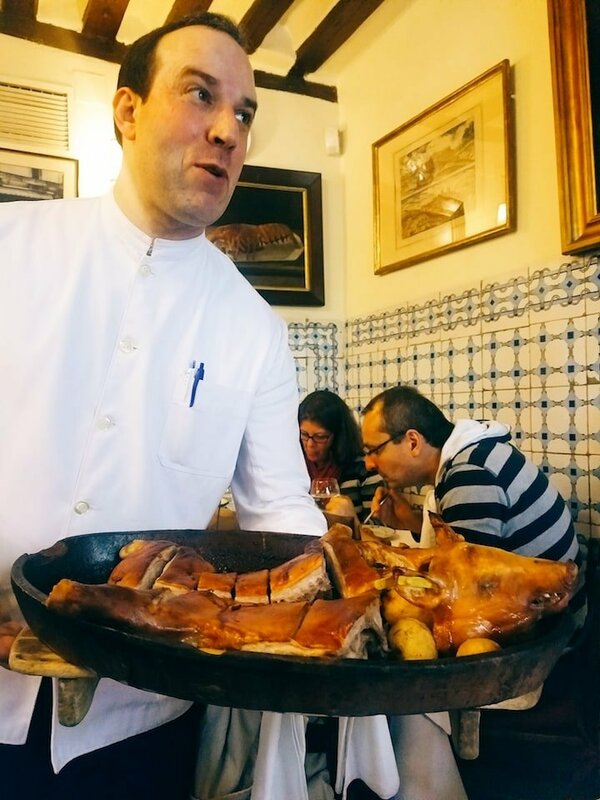 See my favorite cochinillo restaurant in Segovia! 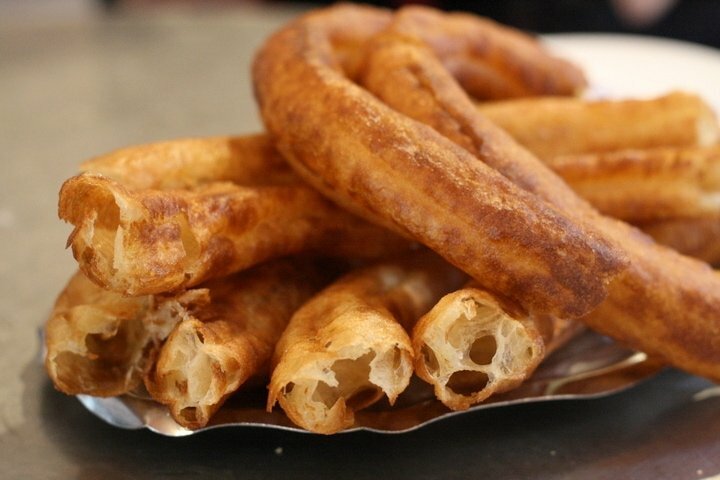 Porras– the churro’s fat cousin. You’ll find churros and porras (two types of fried dough) in breakfast bars all around Madrid. Locals seem to prefer the fatter and doughier porras to their thin and crunchy cousins. The Madrileños dip their porras in coffee, usually leaving the rich chocolate to the kids. Most places in Madrid buy their churros and porras in the morning from a fry-shop (freiduría) and serve them room temperature. I personally need to have my porras hot and fresh, but there aren’t many options. See my tips below for two places I recommend. Join us: on our Huertas Neighborhood Food and Market Tour to try porras in one of the only places making them fresh! 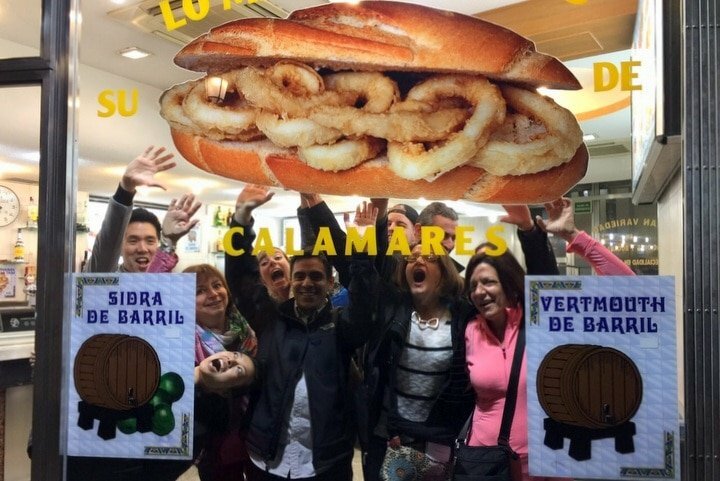 One of Madrid’s most famous calamari sandwich shops! In the month of December Madrid’s Plaza Mayor fills with Spanish tourists doing their Christmas shopping. And a part of that ritual is a mandatory bocadillo de calamares, juicy fried calamari rings stuffed into a plain baguette. No sauce, no embellishments, just delicious calamari flavor. 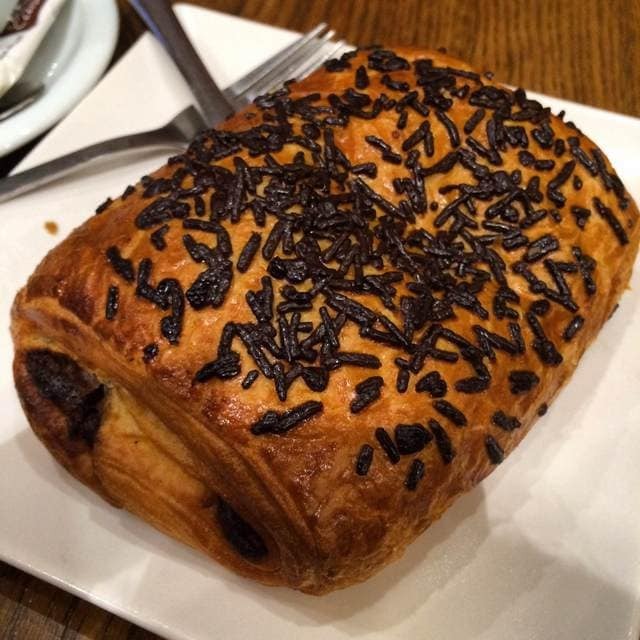 Similar to the French pain au chocolate, this Spanish pastry is a Madrid classic, and something you’ll see in any of the cities pastry shops and cafés. In my opinion, there are very few places to have a good one, though do check out La Mallorquina (details below). My favorite tortilla, from our tours! 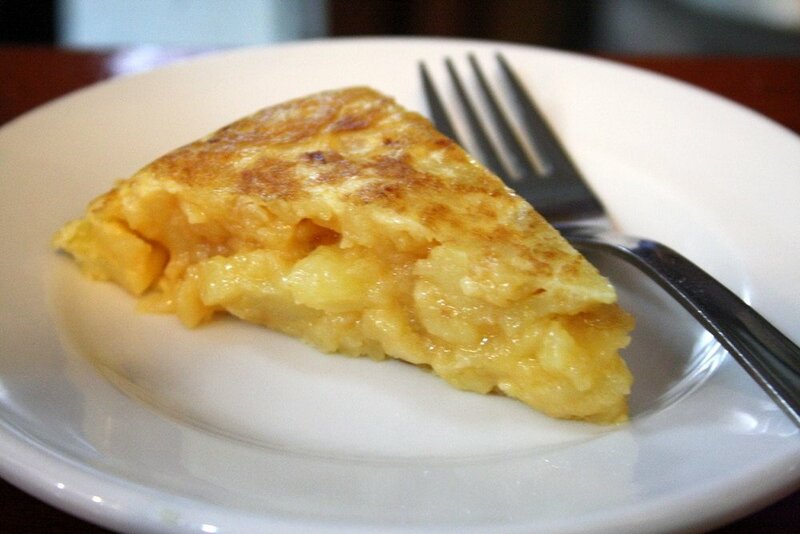 A huge slice of Spanish potato omelet is one of the only Spanish dishes you can enjoy any time of day. Breakfast, lunch, snack, dinner– it’s always a good time for tortilla. This is another dish that can either be incredible or terrible, depending on where you go. Make sure to never have your tortilla reheated (meaning it might come room temperature) as the microwave makes it chewy and overcooked. The chains don’t use fresh eggs (opting instead for liquid eggs from a carton) so do choose carefully! 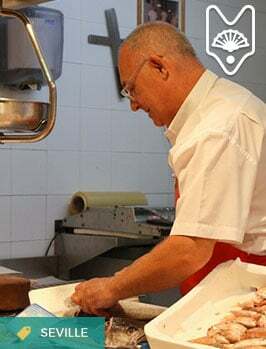 Try my favorite Madrid tortilla on our Ultimate Spanish Cuisine Tour, and meet the master tortilla maker! 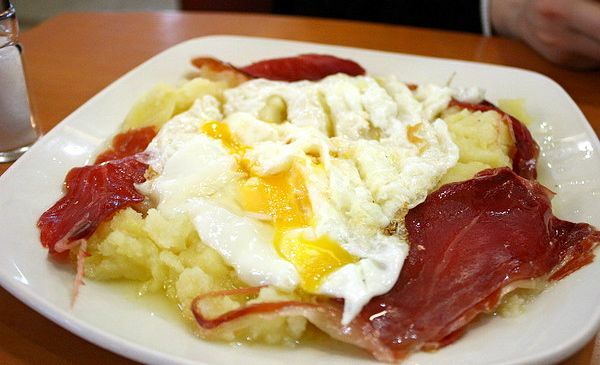 Another yummy egg dish (Spaniards love their eggs) huevos rotos are eggs that are cracked over perfectly cooked potatoes and just cooked until the yolk is still runny. Sometimes the dish includes ham or other meats (chorizo or blood sausage) or peppers. 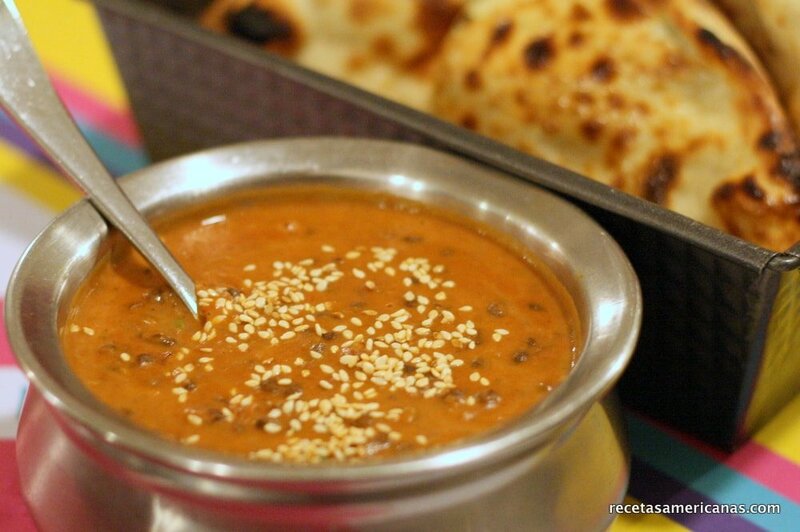 This dish is never served for breakfast– if you ask you’ll be looked at like a crazy person! In Madrid, a beer is a caña— a small glass of about 200 ml. You might think you want a bigger pour– but the beauty of a caña is that it’s always cold (and sometimes each round brings another free tapa!). A cold and refreshing vermouth! If you aren’t a beer lover, try a vermouth, another of Madrid’s popular drinks for the aperitif hour. Vermouth is a fortified white wine that’s colored with caramel and infused with all sorts of herbs, spices, fruits, flowers, etc. 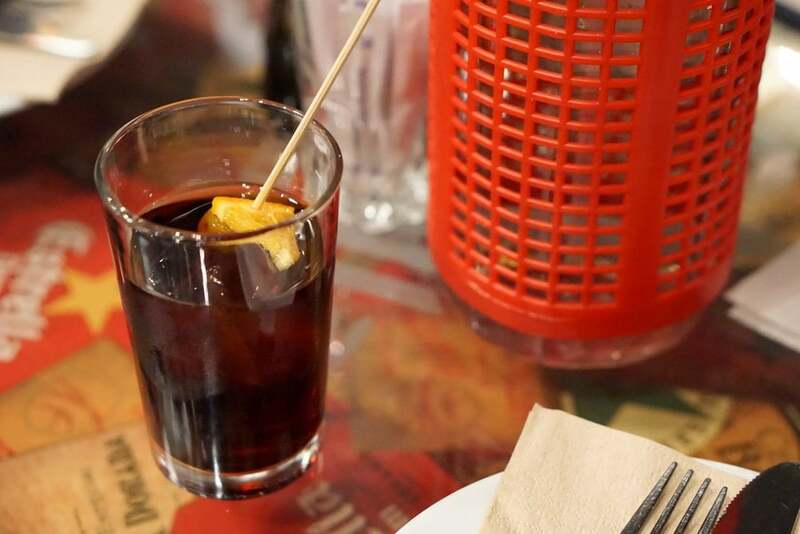 It’s very unique and perfect with the traditional tapas in Madrid– ask for a “vermut de grifo” (a vermouth from the tap) and enjoy! 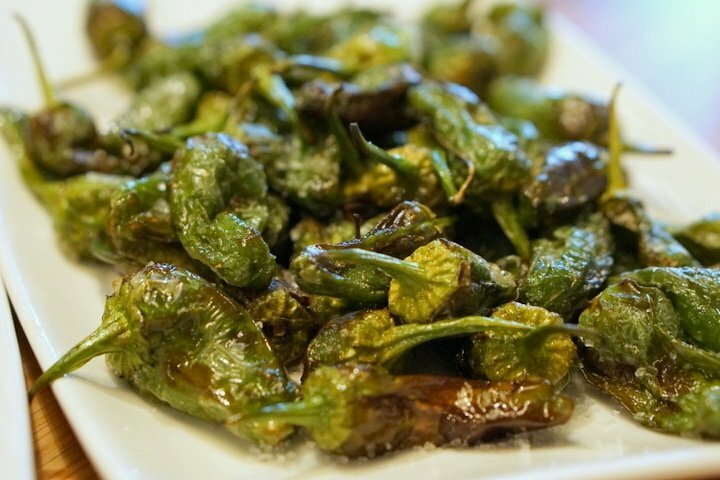 They may come from Galicia, but you’ll see these small fried green peppers in bars all over town. The saying is “some are hot, some are not” because of the fact that every so often one of these peppers is super spicy (most are not spicy at all). 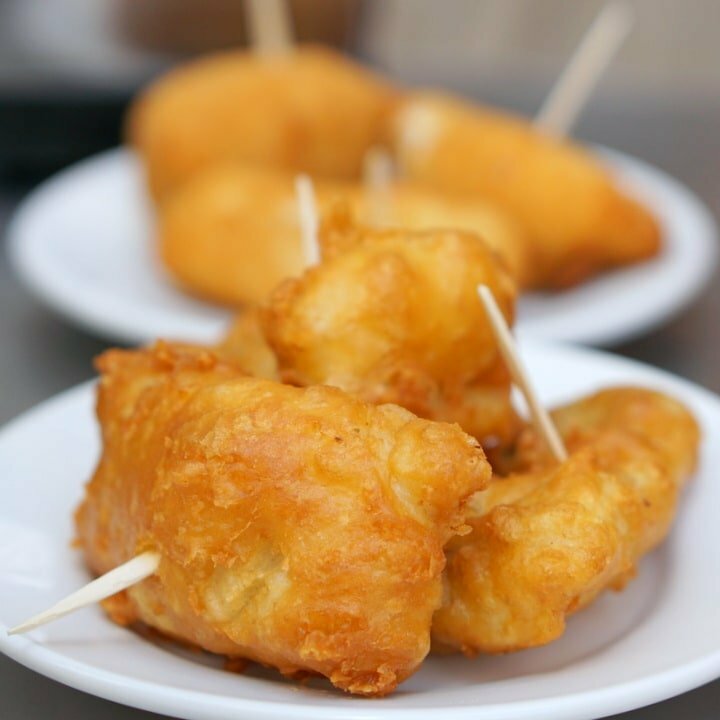 Watch out, because these salt-covered morsels are addictive, especially with a caña! 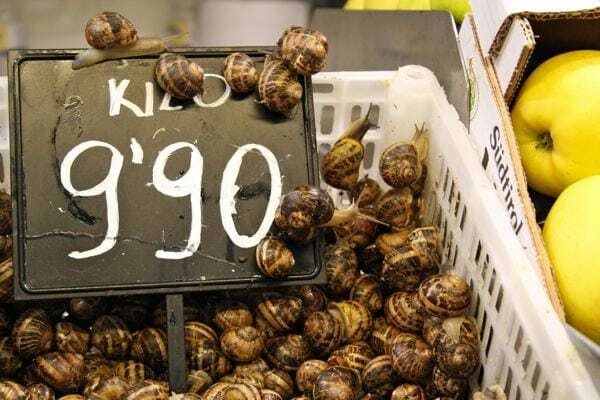 Snails for sale at local markets. Snails are a very traditional dish in Madrid, usually served in a pungent sauce. 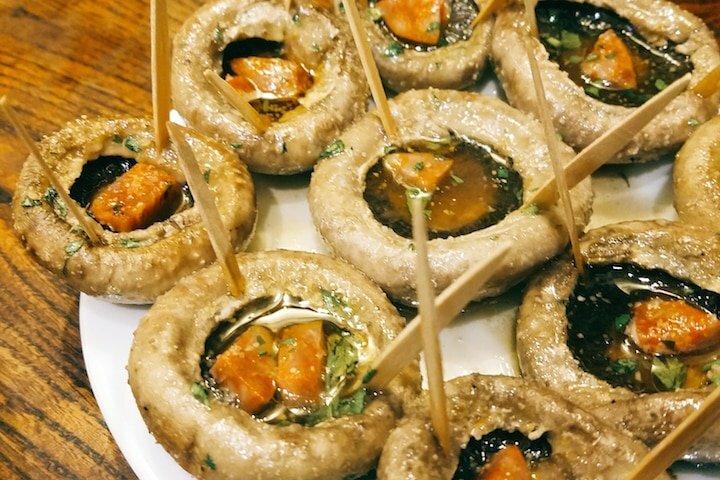 I’m not a huge fan, but if you are, don’t miss Madrid’s most famous snail bar, Casa Amadeo. The famous garlic shrimp in Madrid! Delicious local shrimp, heaps of garlic, extra virgin olive oil, a spicy chili pepper, and hearty bread to sop up the sauce– this is what gambas al ajillo should be! Watch out for cheap versions of this dish, which use shrimp from China (which aren’t regulated for health concerns) instead of local Spanish shrimp. Try the very best at the bar that claims to have invented them on our Tapas, Taverns and History Tour. Perfectly fried potato wedges with spicy bravas sauce (and sometimes garlicky alioli too– just ask for patatas bravioli), this is the definition of bar food! Tour with us: We try 10+ of Madrid’s traditional dishes on our Madrid food tours (while also learning about the city’s culture and cuisine). I’d love to have you join us! I warned you– there are 8,000+ places on TripAdvisor alone. It’s been tough to narrow down my favorites to this list– but here you can’t go wrong! A careful selection of the best of the best– from “old man bars” to modern tapas, this is my ultimate list! 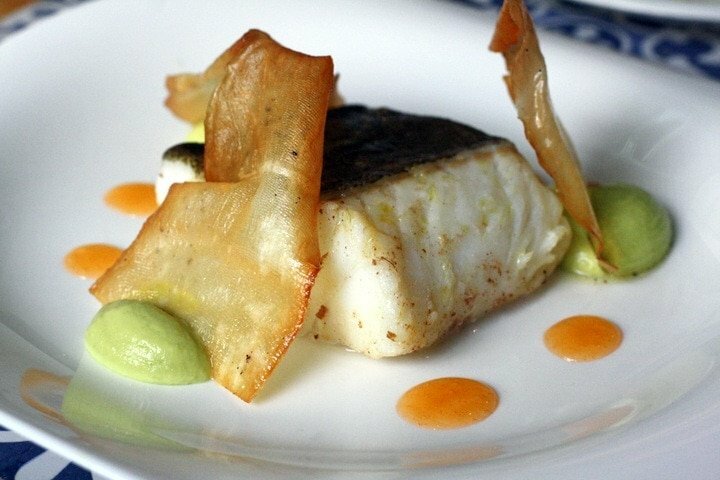 Cod and vermouth, a perfect combo! The best place in town to try cod fritters. It’s always super packed– but just squeeze in, make your way to the bar (don’t be shy) and ask for “dos bacalaos”. 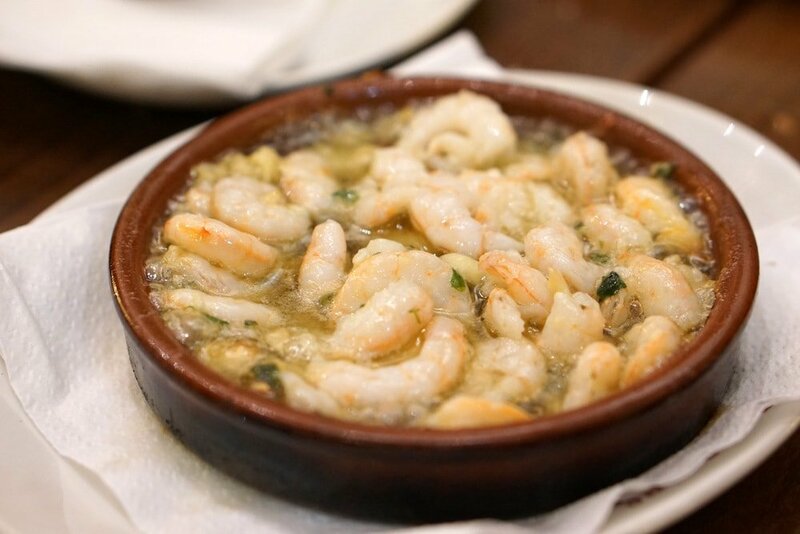 Wash them down with a caña, and you’ll be in and out within 15 minutes– the perfect tapas stop! Famous for their grilled mushrooms, which are stuffed with bits of chorizo and garlic, this historic tapas bar is as quirky as it is delicious. Another place that is often packed, just squeeze on in and order a plate of the “champiñones”. 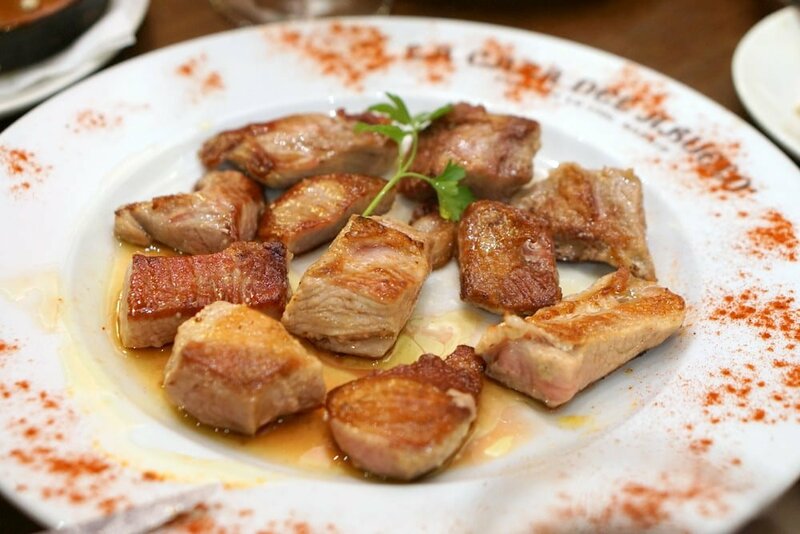 Secreto Ibérico– one of the best cuts of Iberian pork. Melts in your mouth! The most famous place in town for gambas al ajillo, this traditional Madrid tapas bar is one of my favorites, and their restaurant menu is fantastic too. Another historic Madrid tapas bar, Casa Labra is famous for being the place where the Spanish socialist party was founded. 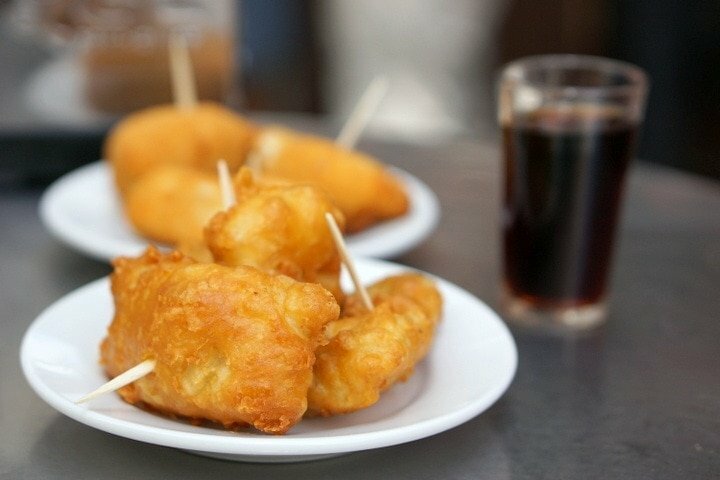 But apart from politics, people come here to chow down on an amazing combination of vermouth and salt cod croquettes. Enjoying Casa Toni on a Devour Madrid tour! One of my favorite Madrid tapas bars for traditional plates, Casa Toni is heaven for lovers of the authentic. Famous for its organ meats, it is the perfect place to come if you’d like to try braided lamb intestines, tripe stew, or kidneys. But when I go, I dive into fried eggplant with honey, padrón peppers, or fried baby squid- yum! Probably Madrid’s most famous restaurant (the oldest restaurant in the world, according to the Guinness Book of World Records), Botin is an institution and an absolute must for foodies visiting Madrid. 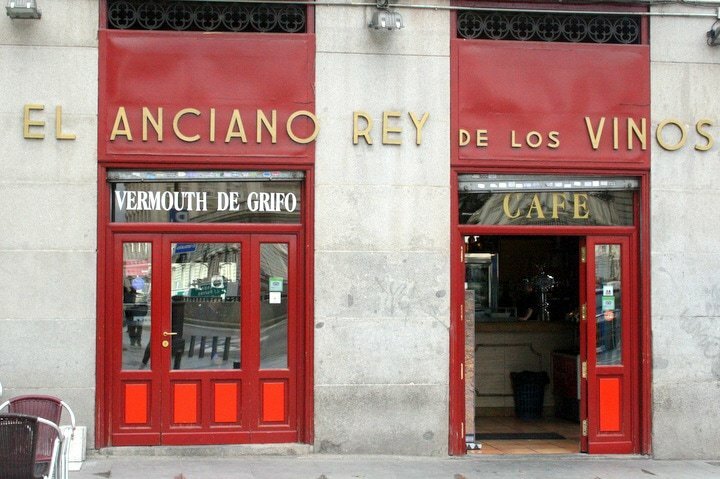 The restaurant was opened in 1725, and was a favorite hangout of Ernest Hemingway during his time in Madrid. The gorgeous restaurant is a museum in itself, which is why we include it on our tour of the best of Madrid, Prado Museum + Botin Lunch Tour. Don’t miss the undrgraound wine caves– connected to the rest of the city by tunnels (though no longer functional, unfortunately!). The specialty of the house is the roast suckling pig, some of the best I’ve ever had. Don’t rush you experience here, and I would recommend going for a leisurely lunch over dinner! 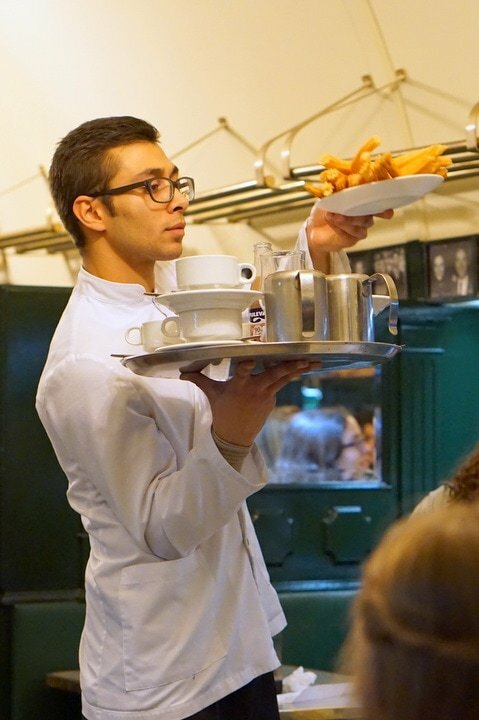 Reserve our Behind the Scenes Botin Lunch and Prado Museum Tour here! El Anciano Rey de los Vinos– a classic! Right across from the Royal Palace, I ignored this place for years before finally realizing how amazing it is! Famous for its traditional dishes (like bull tail and huevos rotos) it also has great vermouth and red wines, and its own sweet wine with cookies too! 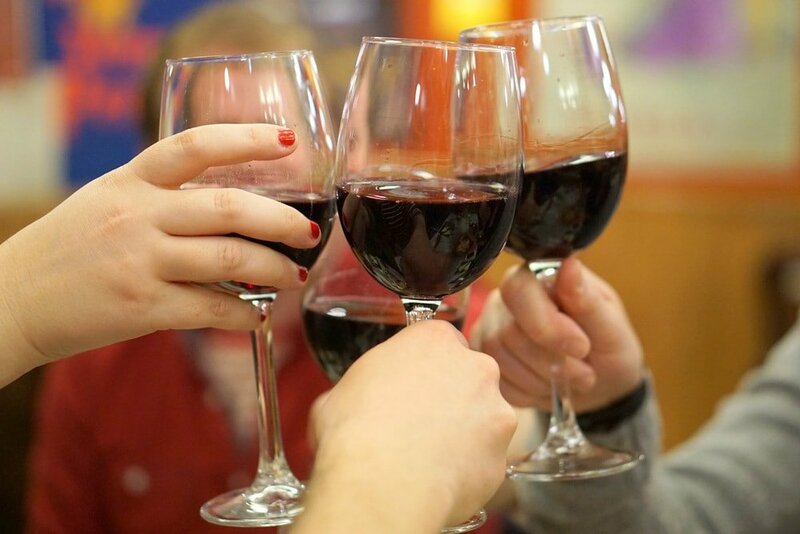 Wine lovers are drawn into this popular wine bar on Calle Cava Baja in the tapas-filled La Latina neighborhood. I haven’t been a fan of the food here, but for a drink and some cured meats, it’s perfect! 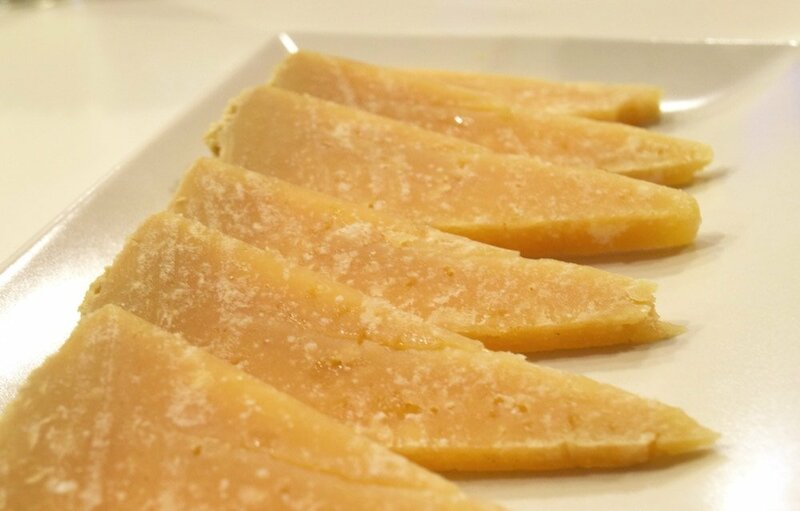 You can see the crystalized goodness in this cured Manchego! 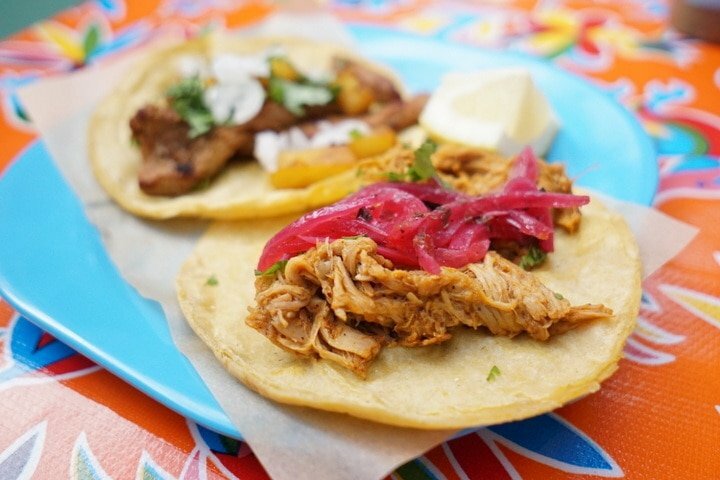 Go off the beaten path in the La Latina neighborhood and stumble into this local gem. 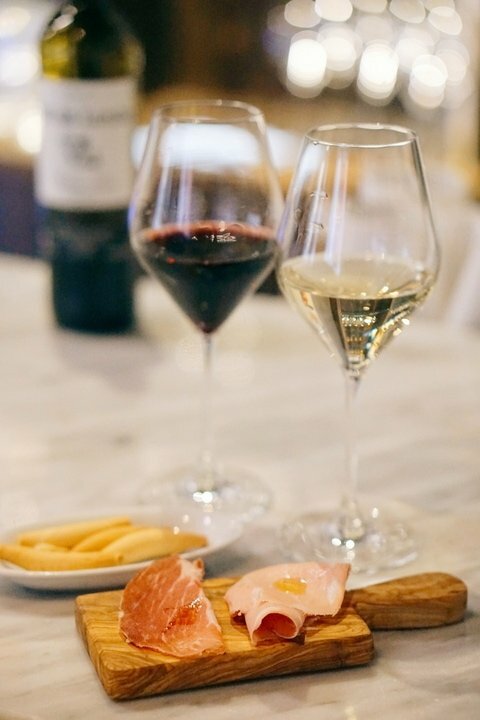 Order a glass of wine and a tapa of some of Spain’s best cheese, and just be happy! Delicious mojama, cured salted tuna. 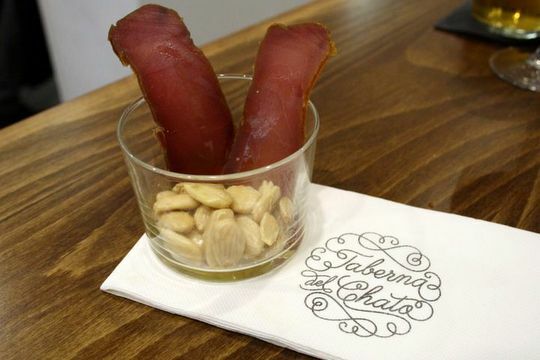 A lovely addition to one of Madrid’s most traditional tapas streets, La Taberna del Chato specializes in small tapas served in chato glasses (small old-fashioned wine glasses). You must taste their partridge paté (just trust me) and their fried langostinos are another favorite! 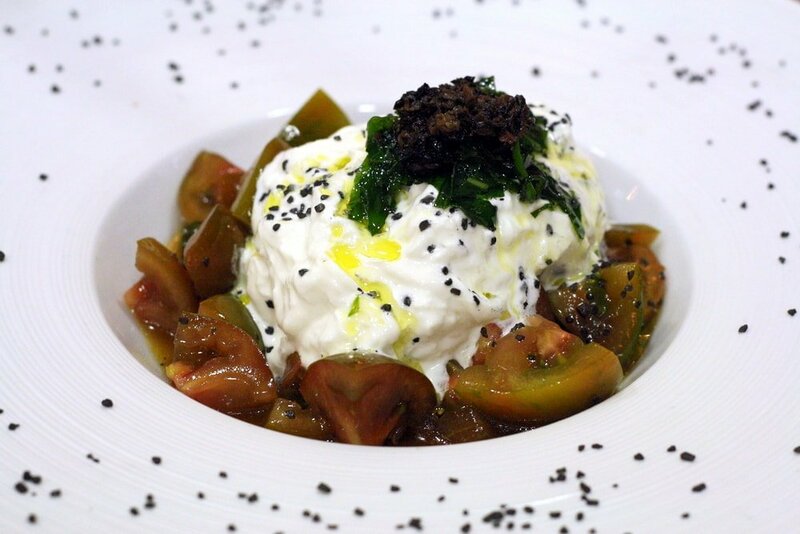 The epic burrata at La Berenjena. Ever since one of the owner’s of this tiny bar appeared on the Spanish version of MasterChef, it’s no longer been a hidden discovery. They’ve just opened a second location in trendy Chamberí, but you should run over to the original, squeeze in at the bar (there are only a few tables) and get ready for some of Madrid’s most delicious food. Pintxo of goat cheese and caramelized onions. Another La Latina tapas bar with great wines by the glass, Casa Lucas is tiny and cozy. The food is delicious, and it’s a great place to have a full meal. Reservations are recommended. A popular La Latina bar for tostas (toasted bread with toppings), they’re some of the best in the area. The bar is very casual and popular with a younger crowd, but the tostas and local ambiance are well worth it! Fabada, a stew you must try! 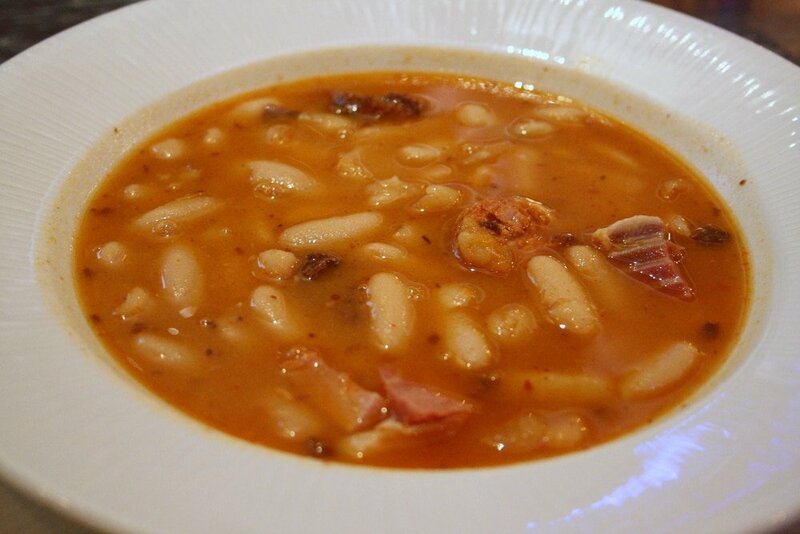 One of the most famous Asturian restaurants in Madrid’s city center, I love their menú del día (daily lunch menu) in the wintertime, when a hearty bean stew like fabada is the only thing I crave! Casa Dani is a legendary bar/restaurant located in the Mercado de la Paz in the Salamanca neighborhood. They serve one of my favorite tortillas in the city (a must-try) and have a famous menú del día filled with delicious traditional dishes. 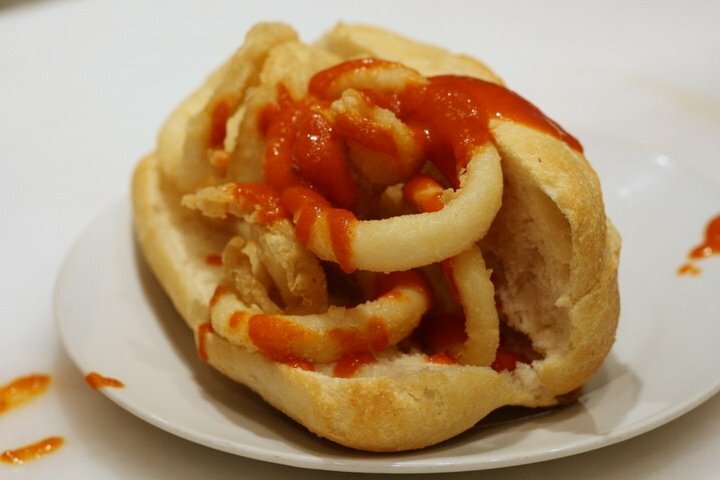 The BEST calamari sandwich in Madrid! My pick for Madrid’s best calamari sandwich, Bar La Campana is always the place with the longest line at Christmas time. 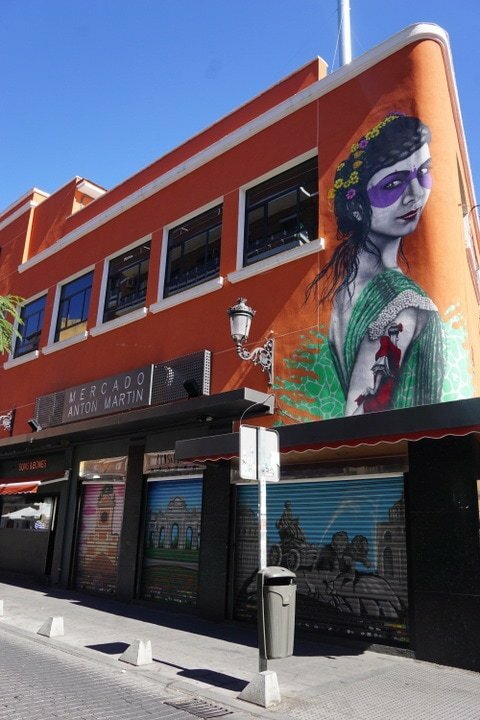 Located right off of the Plaza Mayor, this is the place to go for a truly local experience. Try it: Of course we taste this treat on our Ultimate Spanish Cuisine Tour— how could we skip it?! One of my favorite Andalusian bars in Madrid, Sanlucar specializes in sherry wines and delicious food. Their Iberian pork dishes melt in your mouth, and their cuttlefish stew is another must-try dish. This family-owned tapas bar is one of the city’s best places to try tapas typical of southern Spain. 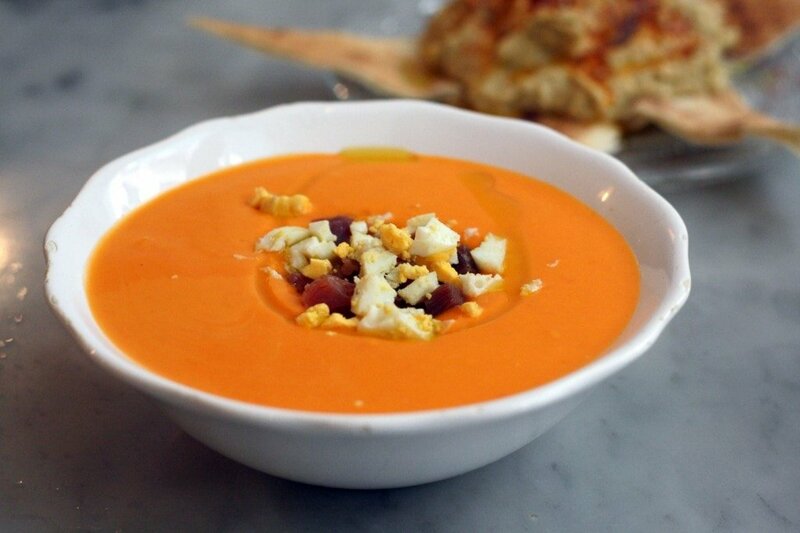 Their salmorejo is a great choice, as are their croquetas! 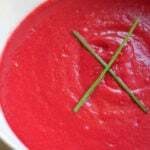 Get my recipe for authentic Andalusian salmorejo! 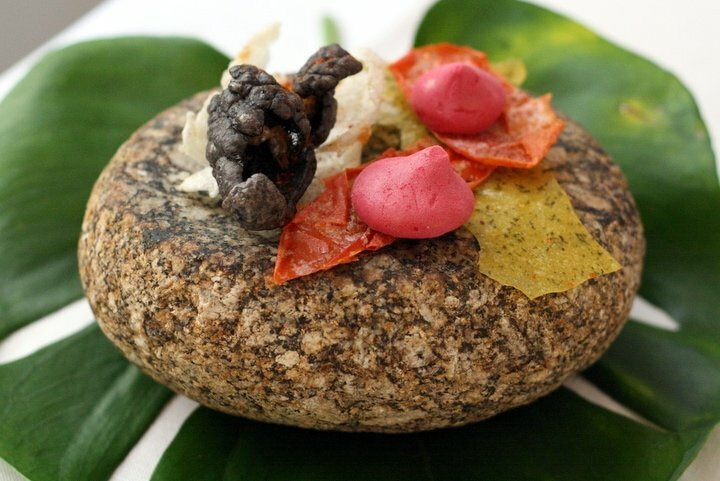 You’ll find modern dishes at La Chusquerey. Looking for fusion food? La Chusquery is a great option, as their dishes blend Spanish and Asian flavors. They have a great menú del día too. One of my favorite restaurants in all of Madrid, Celso y Manolo does great food, mostly organic, and has a casual ambiance perfect for any night of the week. 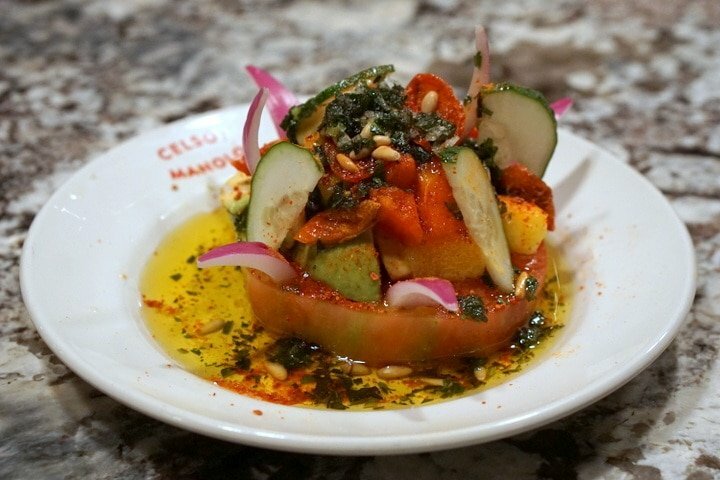 Their Beefsteak Tomato Salad (chuletón de tomate– pictured) and red prawns are both to die for! Delicious paprika covered pulpo (octopus). THE place to try traditional northern Spanish food in the city center. 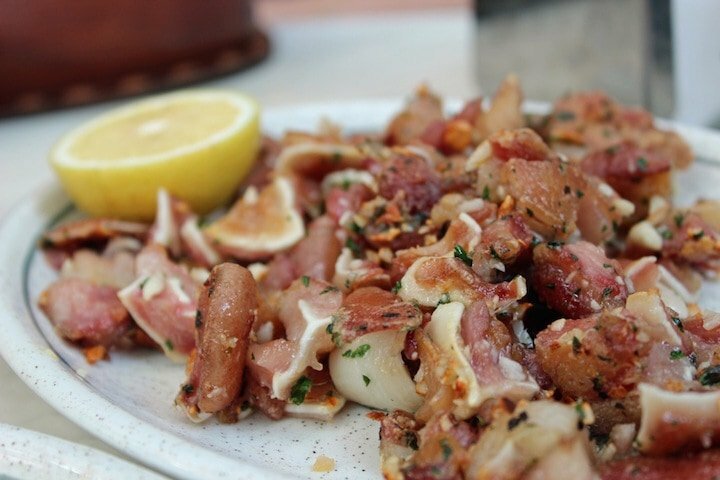 Just steps away from the Plaza Mayor, you’ll find tender grilled octopus, and hearty fabada. Delicious cocido at La Sanabresa. A place trapped in time, La Sanabresa is a “Casa de Comidas” which is basically a Spanish type of restaurant that feels like you are eating in someone’s living room. You come here for the menu of the day, which is comprised of three courses (first, second and dessert) as well as wine. I adore the cocido Madrileño here, which is served on Tuesday afternoons during the cocido season! Spanish wines are some of the most exciting in the world right now (in my humble opinion!) and these places will definitely pour you something worth drinking! Delicious tapas and wine at Angelita. My favorite wine bar in Madrid (and currently a two-minute walk from my apartment!). Their wine list changes frequently, they offer a delicious free tapa with every glass, and they have wines you won’t find elsewhere. They also have a great cocktail bar in the basement! Wine any night of the week! Another excellent wine bar and small shop, La Fisna has a small menu that is worth trying. Photo by: GQ Trippin on our Huertas tour! This old fashioned Spanish deli and tapas bar is one of the most picturesque places in all of Madrid. 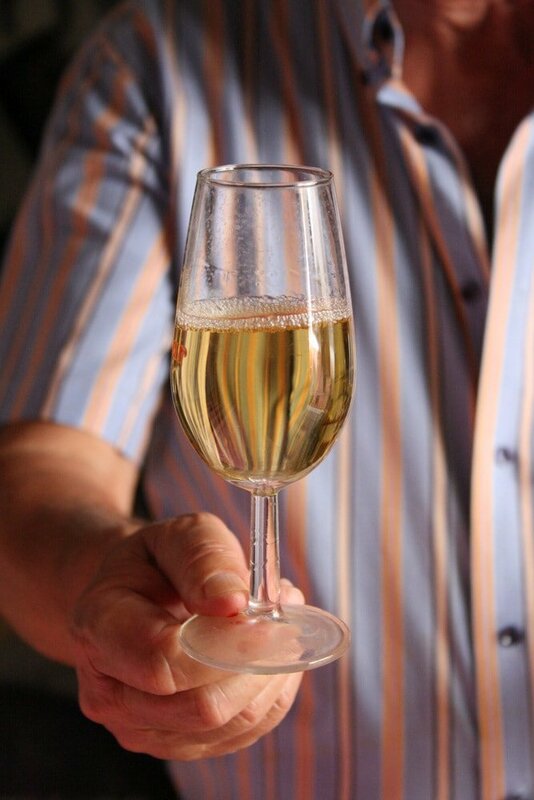 We visit on our tours for a wine and cheese tasting, and everyone loves it! A great wine list, and delicious tapas (I’ve heard the restaurant is great too) some of which have a Middle Eastern flair. It’s a place I always want to revisit. A flight of sherry wines, beautiful! The perfect place for sherry lovers or people wanting to learn more. 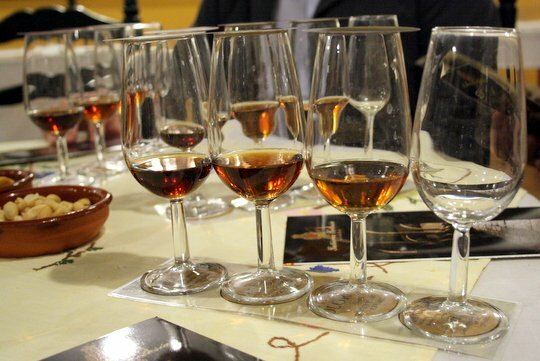 Palo Cortado specializes in sherry wines, and holds frequent tastings in their restaurant. Old man bars are the best! A different kind of sherry bar, La Venencia hasn’t changed a bit for the past 70 years or so! Filled with locals, this historic tavern was supposedly a favorite haunt of Ernest Hemingway himself. They serve only dry sherry wines, a few tapas, and tipping (or photography) is not allowed. If you stop by, see if you can spot the bar cat! 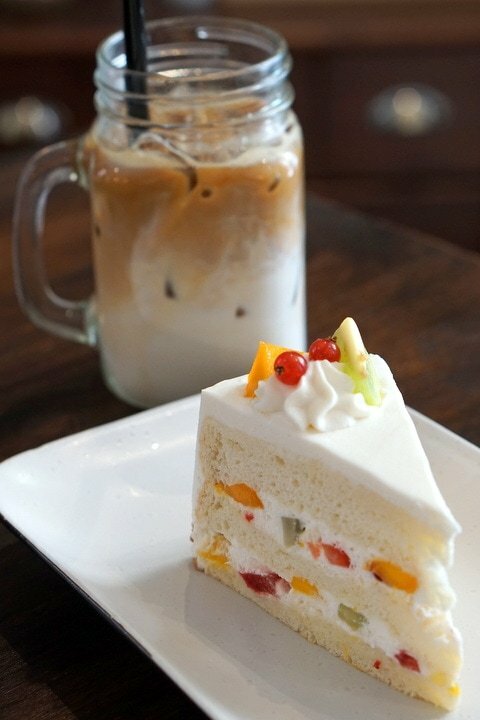 Because everyone needs coffee and sweets in their lives! Here are some of the best places in Madrid to get your fix. Delicious coffee, homemade pastries and heaping breakfast tostadas— this place is perfect and most people know it! Get there early on weekends (around 10am or 11am– that is early on a Spanish weekend!) for a spot to hang out. 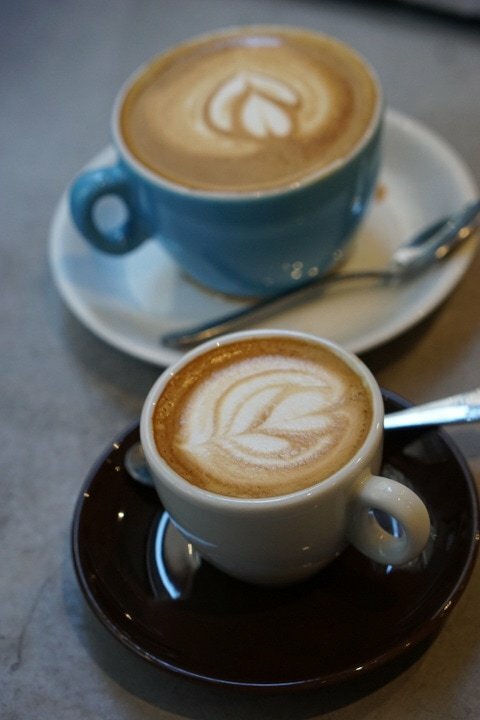 Located right near the Callao metro stop in the city center, Coffee and Kicks is hidden away on a side street. It’s a tiny place, but serves some of the best coffee in the area. Great for a pick me up while shopping. Photo by GQ Trippin on our Huertas tour! 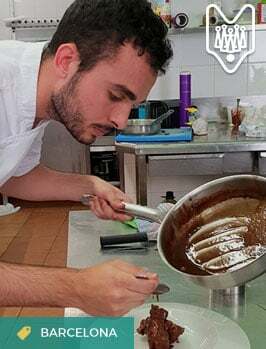 Alfonso and his team serve the best porras and chocolate in town– they’re so good that they’re the start of our Huertas Neighborhood Food and Market Tour! Get there early in the day for breakfast churros, or around 5pm for merienda (afternoon snack). In between, they serve a lovely homemade menu of the day. Talented waiters at San Gines! In every guidebook (for a reason!) 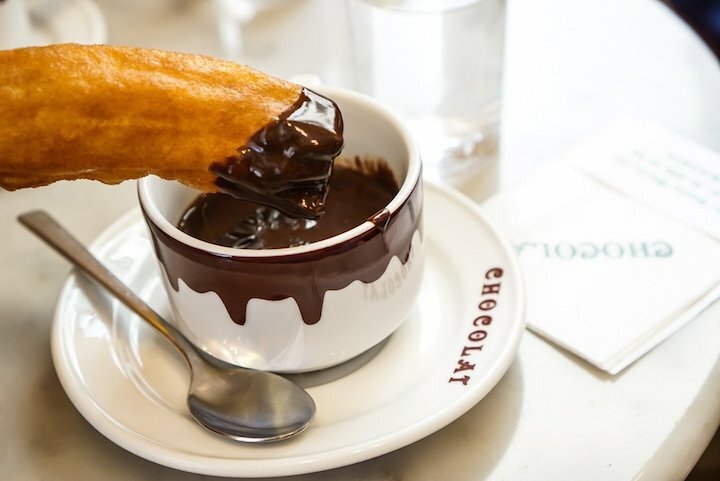 San Ginés serves churros and chocolate all day long. The ambiance is great and the place is a classic– a must! One of Madrid’s oldest and most historic pastry shops, the family behind El Riojano are true professionals. They specialize in seasonal sweets (there’s one for every holiday here in Spain) and are truly proud of what they do. 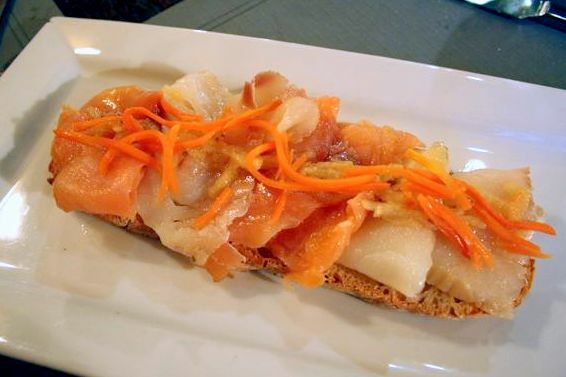 We visit them on our Ultimate Spanish Cuisine Tour, where we start the morning with their secret recipe! 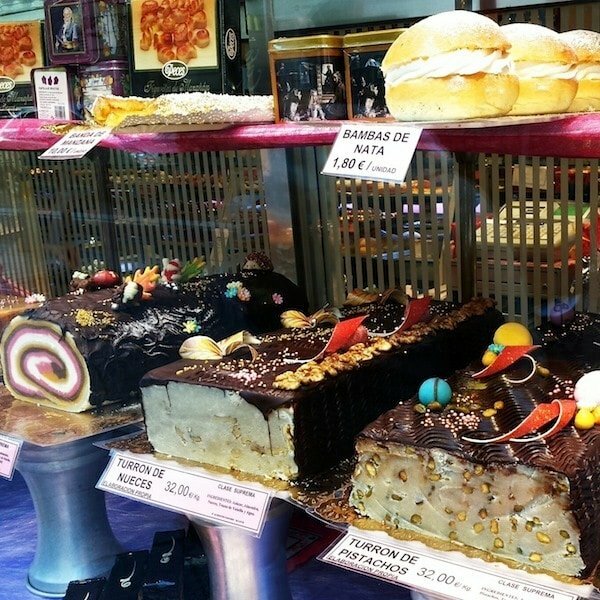 Delicious window display at La Mallorquina! Famous for their excellent location (right in the Puerta del Sol) and their warm napolitana pastries (get them right when they open in the morning for food heaven!) this is one of the best pastry shops in town for classic Spanish pastries. I find that in Madrid we are spoiled for choice, and leave fine dining for very special occasions. But here are two places worth a try! Offering an innovative and incredible value tasting menu (get there before the Michelin Guide does), I’ve only been here once but have been eager to return ever since. I actually haven’t been here yet (hint, hint Alejandro!) but I have heard amazing things from VERY trustworthy sources! Headed by famed Madrid chef Diego Guerrero (who bravely left the 2-starred Club Allard to do his own thing here) it’s on my shortlist for 2017. We are so lucky in Madrid, as we have a multitude of international restaurants to choose from. Here are just a handful of my favorites. Hands down the best Indian restaurant in Madrid, and great ambiance too. Reservations far in advance are recommended! This super casual hole-in-the-wall is basically fast food (no table service, long lines, cheap), but the tacos are authentic and delicious. This is actually outside of the city center (sorry!) 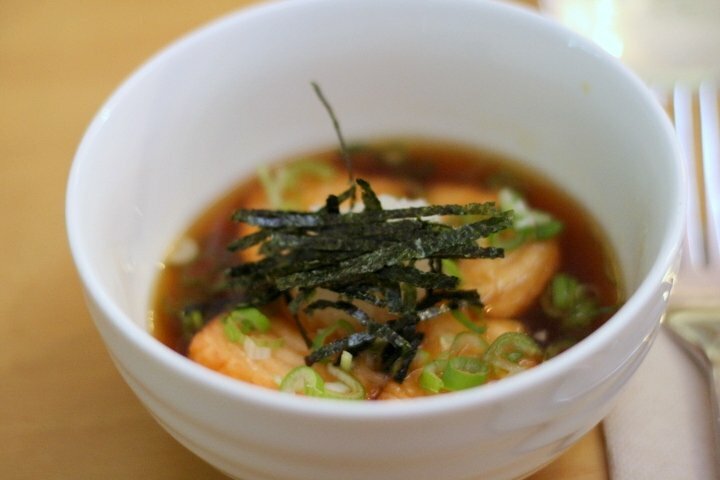 but it’s one of the best and most authentic Japenese restaurants in Madrid. Home to my favorite burgers in Madrid (and they have excellent veggie burgers too). 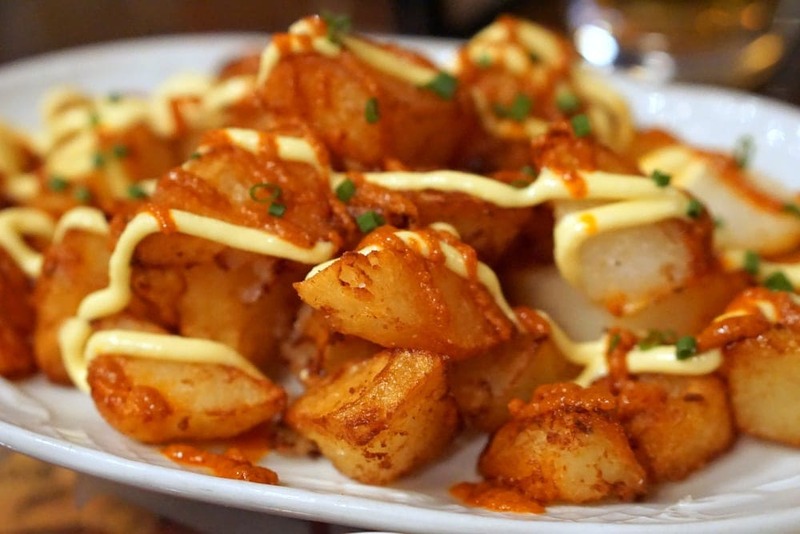 If you go definitely try their patatas bravas with homemade roasted garlic alioli! One of the best Italian spots in Madrid, Jonni and Massimo opened this stall in the traditional Antón Martín market a few years ago and have been going strong ever since. 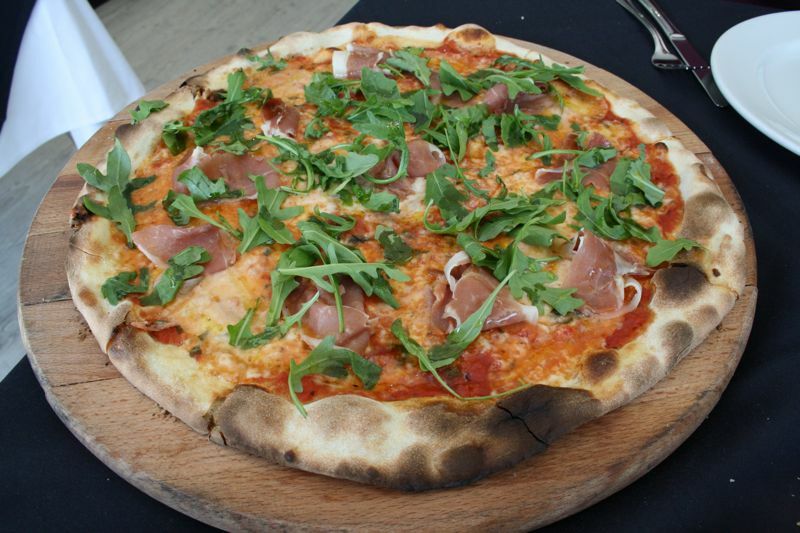 Amazing pizza and a great value menu of the day. Great pizza by the slice on the popular Calle León in the Huertas neighborhood. If you order take away (or they do deliver in the same neighborhood) you can call up for a whole pie. My favorite casual Mexican restaurant in town, the lamb cazuela and cucumber margarita with a spicy rim are a perfect combination! This is by far one of my favorite menu of the day places in Madrid. 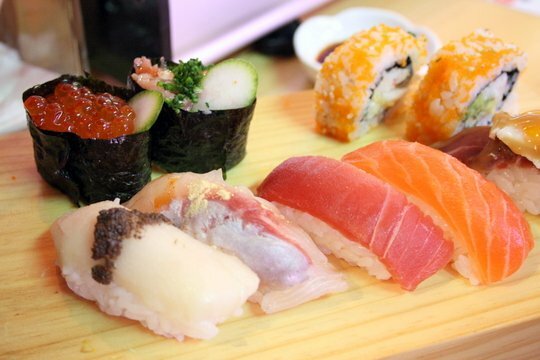 The concept is interesting– Japanese and French food under one roof. What I love most (that is surprisingly rare in Madrid) is that their menu of the day actually changes daily! This is the way it should be– and it never disappoints! I haven’t yet been here, but it’s another place on my asap list! This is known as some of the best Ethiopian food in Madrid. I’ve never tried Ethiopian food, and am definitely intrigued! I believe markets are a city’s true soul. Madrid has a market in every neighborhood and I always try to shop in them to support the small guys and keep this market tradition alive! I won’t go into too many details of each of these markets here, but if you have time and love food, visit each one! A bread and service charge is often added to the bill and ranges between 1€ to 3€ per person, depending on the place. If you don’t want bread brought to the table, specify sin pan por favor, though unfortunately sometimes you’ll still be charged a cover fee. Don’t take offense when in the classic tapas bars the waiters seem like they don’t want to be bothered. They’re not being rude– just busy! You often have to be assertive to get a waiter’s attention– feel free to signal him/her over. This is not rude. Don’t expect to be asked if you want a second drink, more food, the cheque etc. Just be assertive and ask! You aren’t required to tip in Madrid, but rounding up the bill and leaving up to 10% for excellent service is definitely appreciated (I always tip my servers). Waiters work hard and earn a very low monthly wage. At some traditional places the menu won’t be available in English. Always order slowly and ask for help! If you are planning to visit Madrid I would love to have you join one of Devour Spain’s Madrid food tours or Madrid tapas tours. Our tours are fun and engaging cultural experiences where you’ll try 10+ different foods at a variety of traditional, family-run places. Between bites, you will learn plenty about Madrid’s unique culture, cuisine, history, and traditions. We currently offer five fantastic tours (and I’m not just saying that because I helped design them!). They really capture the soul and identity of Madrid, and are a lot of fun! You can reserve spots online here: book Madrid food tour. And if you have more tips for eating and drinking in Madrid (the best things to do in town! ), please leave them in the comments! And if you’ve already been– where (and what!) did you try? Fantastic list! I’ve been to some and added a ton more places to my running list of places to try. Get to DSTAGE ASAP, they just got their second Michelin stat. I went for my 1 year wedding anniversary and it was an amazing experience. I heard that– I wish I’d gone as soon as it had opened! Thanks for the comment and for reading! Hi Emily– this comment made my day! It’s my dream to write a book one day– but I’m not ready yet 🙂 I love Penelope Casas and have most of her books at home. Would have loved to have met her… Thank you again for commenting, let me know the next time you both pass through Madrid! Un abrazo! I am completely obsessed with this list — thank you! We’ve tried a few, but now definitely have more than a few more to add to the list. Awesome work! And the roast chicken is wonderful! I’ll be visiting Spain this fall and this blog post has been great for ideas on where to eat in Madrid. I’ll be taking one of your food tours in Seville (Evening Tapas and Flamenco) and am very excited about that. I’m a travel agent and always looking for great info. Thanks for all the helpful info! Hi Jolynn– thanks for the comment! I’m happy to be of help and so glad we will see you on a food tour in Madrid! In your opinion is it hard for a vegetarian in Madrid? Not at all– most places have some dishes and/or substitutions and it’s becoming more and more common very day. There are a ton of new vegetarian or veg friendly restaurants that have opened in the past few years alone, but also more and more places offer vegetarian friendly options. Pingback: The Best Kitchen Stores in Madrid – Where to Stock Up on Cooking Essentials - An Insider's Spain Travel Blog & Spain Food Blog! Any suggestions for a great breakfast place that serves huevos a la flamenca? These are generally a lunch/dinner – not breakfast! Baked eggs in Madrid can be found at the café Plenti, and traditional Spanish breakfasts can be found at Taberna Carmencita on Calle Libertad. Hope this helps!